Spring boot provide view technology to front development. here is spring boot freemarker example. 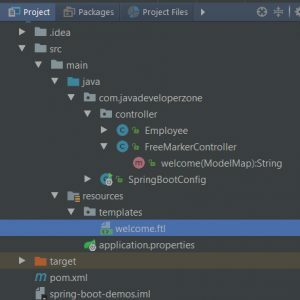 spring-boot-starter-freemarker dependency requires in class path so spring boot automatically configure freemarker configuration. For freemarker require .ftl template file which must be available inside resources\templates folder. Its like normal spring controller which handle require and return String which is name of freemarker template name which is available in side resources\templates. Spring will try to find resources\templates\[TEMPLATE_NAME].ftl file. * Created by JavaDeveloperZone on 26-09-2017. It must be available insider resources\templates folder.